A Surrey woman who has spent more than three decades helping disabled people learn to ride has been recognised in the New Year Honours list. Muriel Holyman, 99, has been awarded a British Empire Medal (BEM) for the empathy and understanding she showed. She has volunteered at the Diamond Riding Centre in Carshalton, south London, since it opened in 1974. Miss Holyman remembered how a friend showed her the centre for the first time and she said: "I was sold." She said the honour came as a great surprise and she was "completely staggered at the news". One of the highlights was when disabled artist Alison Lapper came to the centre as a small child, she added. "She was absolutely terrified," Miss Holyman, from Banstead, remembered. "We became great friends and have remained friends ever since. She doesn't ride now but did for many, many years and now she's written a book." Miss Holyman said she wanted to highlight the scale of the operation at the riding centre, which she said had 30 ponies, and helped about 370 adults and children to ride each week. She said: "They have to raise quite a lot of money. "From time-to-time they pick me up and take me down there, so I keep in touch. They have changed over time. There are ever so many volunteers. It's a huge operation." Miss Holyman's citation said she regularly helped severely disabled children and adults at the centre, showing great empathy with the riders and an understanding of the therapeutic value of horse riding. She said: "With learning disabled children you can get their attention and it helps their concentration and with the physically disabled you would be amazed at the difference in them." Across Surrey, David Cherry, from Hinchley Wood, has been appointed an MBE for services to children and young people. Mr Cherry is a composer and arranger for the Boys' Brigade Marching Bands. Former England cricketer Mark Ramprakash, who used to play for Surrey County Cricket Club, has also been made an MBE. Hilary Whittaker, chief executive of Beating Bowel Cancer has also received an honour. 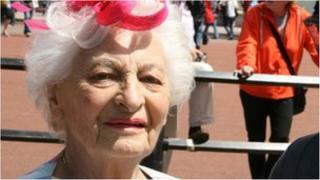 Ms Whittaker, of Thames Ditton, was made an MBE for services to Bowel Cancer Awareness.